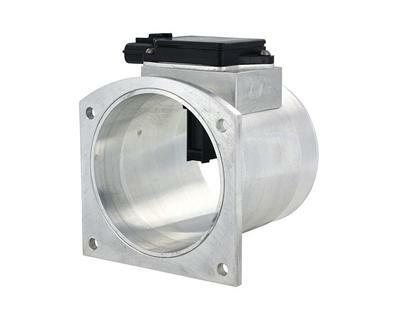 The SCT 90MM Big Air Mass Airflow Sensor is great for modified and custom tuned applications where the stock mass air meter “pegs” due to increased air flow. SCT’s Big Air MAF Meters feature OEM quality calibration for factory level drivability, repeated accuracy, and reliability. NOTE: There is absolutely no returns on MAF Meters. Specifically designed for supercharged applications the SCT BA-3000 Big Air 90MM MAF can handle much more power than the wimpy stock units. The SCT BA-3000 MAF supports 400rwhp to 825rwhp on Centrifugal Blower applications, and 400rwhp to 825rwhp with Root Style Blower applications while helping retain factory drivability. The SCT BA-3000 90mm Big Air MAF is a direct bolt-on replacement for the 2000-2004 Ford Lightning and the 2003-2004 SVT Cobra, but can also be used on virtually any Ford* vehicle requiring a high flow mass air meter. * some fabrication may be required.